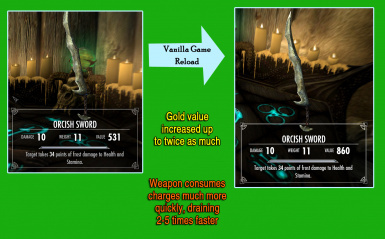 Fixes the bug that causes weapon enchantments to drain more charges, and increase drastically in price, after the game is reloaded. after you save and reload the game. The price of enchanted weapons also jumps significantly higher. it to incorrectly recalculate the costs associated with player-made enchantments after the game reloads. first enchanted it, no matter how many times you reload the game. Works for custom/modded enchantments too. enchant a new item using the exact same duplicate effect(s) with the same strength. Huge thanks to the hard-working & always helpful SKSE team.